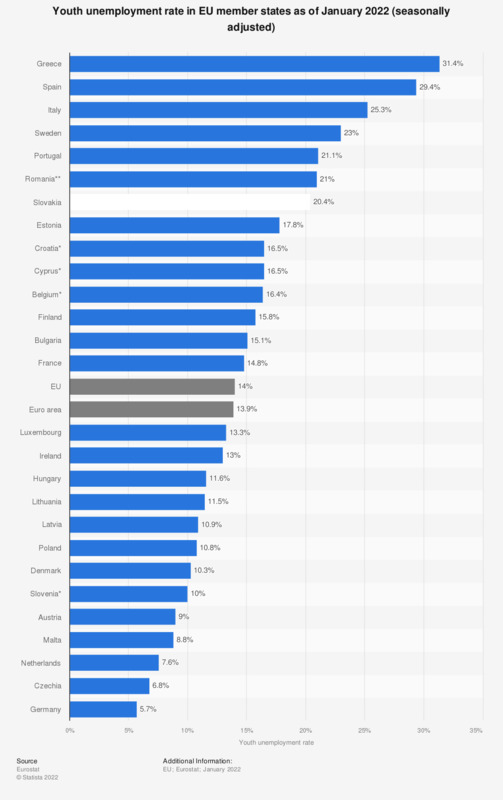 The statistic shows the seasonally adjusted youth unemployment rate in EU member states as of January 2019. The source defines youth unemployment as unemployment of those younger than 25 years. In January 2019, the seasonally adjusted youth unemployment rate in Spain was at 32.6 percent. Unemployment is a crucial economic factor for a country; youth unemployment is often examined separately because it tends to be higher than unemployment in older age groups. It comprises the unemployment figures of a country’s labor force aged 15 to 24 years old (i.e. the earliest point at which mandatory school education ends). Typically, teenagers and those in their twenties who are fresh out of education do not find jobs right away, especially if the country’s economy is experiencing difficulties, as can be seen above. Additionally, it also tends to be higher in emerging markets than in industrialized nations. Worldwide, youth unemployment figures have not changed significantly over the last decade, nor are they expected to improve in the next few years. Youth unemployment is most prevalent in the Middle East and North Africa, even though these regions report high unemployment figures regardless (Zimbabwe and Turkmenistan are among the countries with the highest unemployment rates in the world, for example), and are also highly populated areas with a rather weak infrastructure, compared to industrialized regions. In the European Union and the euro area, unemployment in general has been on the rise since 2008, which is due to the economic crisis which caused bankruptcy and financial trouble for many employers, and thus led to considerable job loss, less job offerings, and consequently, to a rise of the unemployment rate. Older workers are struggling to find new jobs despite their experience, and young graduates are struggling to find new jobs, because they have none. All in all, the number of unemployed persons worldwide is projected to rise, this is not down to the economic crisis alone, but also the industrial automation of processes previously performed by workers, as well as rising population figures. ** As of November 2018.